Winters in Strathspey often bring enough snow for excellent Nordic skiing. When conditions are right there are many trails that are just perfect for cross-country skiing. This series of maps and guides covers 4 different areas and each map has 3 suggested routes. The area is part of the Cairngorms National Park and there are something for everyone. Highlighted on the maps in yellow the easy trails are mainly suitable for the beginner. The orange and red routes are more suited to the more experienced langlauf enthusiast. The Slochd and Glenmore has trails that are often prepared or pisted. At Feshiebridge and Inshriach there is a vast trail network where skiing can often be on fresh unspoilt snow. Map 1 covers the prepared trails around Loch Morlich and Glenmore and Badaguish. Map 2 describes 3 terrific routes around the forest trails of Moor of Feshie near Feshiebridge. Map 3 moves further south to Inshriach Forest and Uath Lochans near Loch Insh. 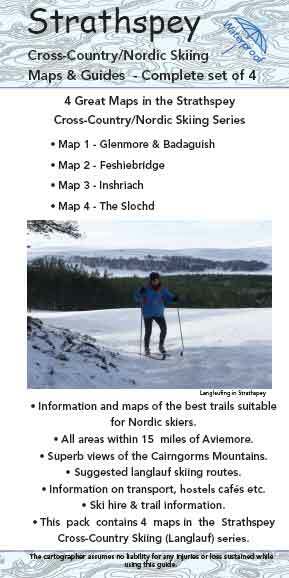 Map 4 covers an area to the northwest of the Cairngorms National Park at The Slochd and Slochd Mor Nordic Ski School. Map 1 - The area around Loch Morlich is part of the Glenmore Forest Park and is at the heart of the Cairngorm National Park. There are many prepared cross-country skiing trails suitable for both beginners and experts alike. This guide describes 3 suggested routes on easily accessible trails with magnificent views of rivers, ancient Caledonian pine forest and mountains. Map 2 - The cross-country skiing trails around Feshiebridge are suitable for both beginners and experts alike. This guide describes 3 suggested routes on easily accessible trails with magnificent views of Glen Feshie, ancient Caledonian pine forest and mountains. This is a heavily forested area at the heart of the Cairngorms National Park. Map 3 - The area around Uath Lochan and Inshriach is at the heart of Glen Feshie in the Cairngorms National Park. There are many cross-country skiing trails suitable for both beginners and experts alike. This guide describes 3 suggested routes on easily accessible trails with magnificent views of rivers, ancient Caledonian pine forest and mountains. Map 4 - The Slochd has many trails suitable for walking, biking and cross-country skiing. On the edge of the Cairngorms National Park, there is something for everyone. There are plenty of easy tracks with magnificent views of rivers, ancient Caledonian pine forest and mountains. A must see is General Wade’s Sluggan Bridge. This is just a short distance from Slochd along the route of the old military road.